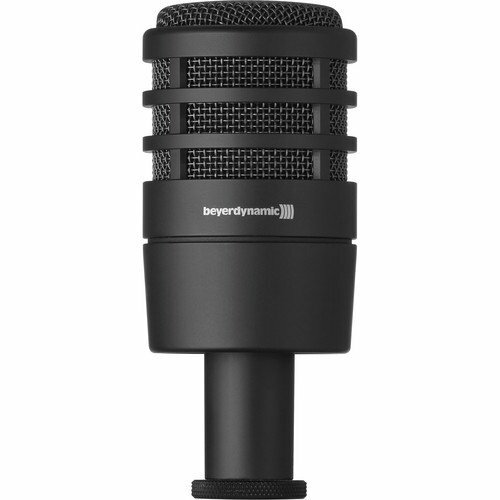 Beyerdynamic's TG D70D dynamic large diaphragm microphone is exceptionally reliable for the transmission of sound from low frequency instruments; perfect for every bass drum, djembe and bass amplifier. The TG D70D can be easily positioned in the resonant head, even in bass drums with very tiny holes. The mass reduced special membrane delivers exceptional impulse fidelity and the hypercardioid polar pattern ensures excellent feedback reduction. The TG D70D offers flexibility with a switchable equalizer. A specially equalized frequency response curve can be set to deliver brilliant sound without complicated settings on the mixing console. A linear frequency response curve can be set to transmit the natural bass drum sound, which can then be acoustically tuned via the mixing console. Since 1924 Beyerdynamic has remained a German family owned company committed to continuous research and innovative developments for the audio market. All over the world, Beyerdynamic is known for the use of the latest technologies and a high quality standard. All Beyerdynamic products are made in Germany.